We provide Cognitive Behavioural Therapy (CBT) in Brighton, Hove and Eastbourne. Our CBT team includes Cognitive Behavioural Psychotherapists and Clinical Psychologists, fully qualified and accredited with the British Association for Behavioural and Cognitive Psychotherapy (BABCP). We are conveniently located close to Preston Park, Brighton and Eastbourne railway stations, making Cognitive Behavioural Therapy easily accessible to clients across the south coastal areas. If you are having problems with anxiety or depression, are stressed at work or experiencing difficulties at home or in key relationships, contact us on 01732 808 626 or email info@thinkcbt.com to organise a local CBT appointment in Brighton, Hove or Eastbourne. We offer appointments in Brighton, Hove and Eastbourne with qualified and BABCP accredited Cognitive Behavioural Therapy experts from just £69. You will not find an established and reputable private CBT service in East Sussex for less. To find out more contact 01732 808 626 or email info@thinkcbt.com. We provide support for a wide range of psychological problems including anxiety conditions and clinical depression. Our Psychotherapists, Psychologists and Counsellors are qualified to the highest professional standards and fully accredited with the BABCP, which is the recognised professional UK body for excellence in CBT. 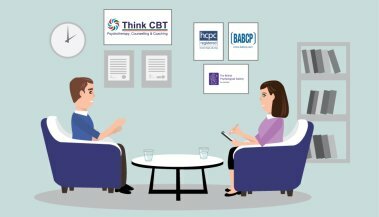 Our approach to Cognitive Behavioural Therapy is cutting edge, augmenting mainstream CBT approaches with modern third-wave methods drawn from the fields of Acceptance and Commitment Therapy (ACT), Compassion Focused Therapy (CFT), Dialectical Behavioural Therapy (DBT) and Mindfulness Based Cognitive Therapy (MBCT). This places us at the leading edge of CBT practice in East Sussex. We are confident that you won’t find more experienced therapists or better value for money in our practice areas. Follow these links to view the detailed professional profiles for Dr Marta De Madariaga Lopez (Chartered Clinical Psychologist) or Rob Thomson (BABCP Accredited Cognitive Behavioural Psychotherapist). With so many therapy providers out there, it's often difficult to work out how to organise therapy and who to contact for objective and independent advice. We believe that we are different to the mainstream in that we combine excellent clinical practice with good standards of customer service. Unlike many of the larger therapy providers, we do not operate on an agency basis or sub-contract our work out to unknown therapists. The money you pay goes directly to your therapist, which means you receive the therapy that you pay for. Immediate appointments with CBT experts without waiting-lists or unnecessary red-tape. The latest CBT techniques drawn from a range of modern therapy models. Only fully qualified CBT experts, rather than under-qualified counsellors or trainees. Flexible clinic times including early mornings, evenings and weekend appointments. Free psychological testing, assessment report and lapse prevention plan. Direct access to emails and catch-up calls following the end of the Cognitive Behavioural Therapy process. If you want to make an informal enquiry to discuss your options or gain an initial insight into how CBT could help you, call 01732 808 626 or email info@thinkcbt.com You can also request a rapid appointment by following this link to our appointments page.